Hayley joined St. Julie’s in 1994, and inspired by her lifelong fascination of how things work, moved on to the University of Liverpool to graduate in 2005 with an M. Eng. in Aerospace Engineering. In 2008, Hayley joined one of Britain’s premier innovators in engineering when she began working with BAE Systems as a support engineer on instrument landing systems. 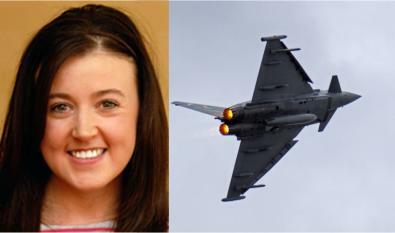 Her success in this role led to a move in 2009 to supporting the Typhoon Supersonic Fighter, one of the most technologically advanced aircraft in the world. In her work on this aircraft Hayley has developed close working relationships both within her own team and with external suppliers such as the Martin Baker Ejection Seat company. She has also had to quickly gain an understanding of highly complex systems, including the Eurofighter’s defensive aids subsystem which controls all of the systems that help the aircraft avoid hostile fire. Hayley gained an ‘Above and Beyond’ award for her work on Compatibility Testing of the Stray Volts Test Cable, and her drive, commitment, zest, enthusiasm and thirst for knowledge has led Hayley to the final stages of the Institute of Engineering and Technology ‘Young Woman Engineer of the Year’ award.